They’re an elite group of teenage girls with magical powers who have sworn to protect our planet against dark creatures . . . as long as they can get out of class! 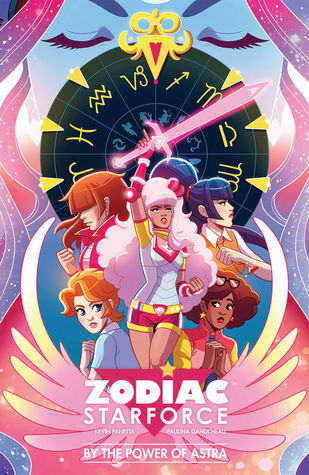 Known as the Zodiac Starforce, these high-school girls aren’t just combating math tests. They’re also battling monsters–not your typical afterschool activity! But when an evil force from another dimension infects team leader Emma, she must work with her team of magically powered friends to save herself–and the world–from the evil Diana and her mean-girl minions! From Kevin Panetta (Bravest Warriors) and Paulina Ganucheau (TMNT: New Animated Adventures, Bravest Warriors), this super-fun and heartfelt story of growing up and friendship–with plenty of magical-girl fighting action–delivers the most exciting new ensemble cast in comics! I saw this the other day in a small local comic book store in Bethany Beach, Delaware. I like to support local businesses wherever I go and this one caught my eye. I always like a good magical girl story and this one caught my eye. So I decided to give it a try! I wasn’t very impressed. I’ve read and watched quite a few magical girl stories, it’s an interesting troupe that not everyone likes or can get right. Zodiac Starforce was just full of troupes from the genre and there wasn’t really anything new. Let’s check off the troupes, shall we? The leader of the group has some sort of pink color pallet, either for her hair or outfit? Check. Leader is really nice and seen as flawless, or when MIA the team freaks out and thinks they’ll fail? Check. The thing that is different with Emma is that she is a woman of color, which was pretty cool. Also she obviously had some sort of PTSD thing going on in the story, but that was never really explored or touched on. She just was reluctant to get back into the swing of things with her friends and the whole Magical Girl Crusade, which you don’t see as often in the popular stories of the genre. Next up, the girl with the pixie cut has reddish-brown hair and has water related powers? Check. Her outfit is arguably a blue or blueish-green? Check. She’s one of the smaller girls, height wise and has terrible luck with men? Check. Could she possibly be gay? Check. Savi was an okay character, but her boyfriend was used as a plot point and I didn’t feel like her romantic relationship with one of the other characters was really there. I thought it was cool that there was a gay relationship in the story, but it felt a little tacked on and I didn’t think it was handled correctly. Also, bonus, the modern planet for Pisces is Neptune, and in Sailor Moon Neptune was one of the lesbian sailor scouts. Next! Can the one mostly red magical girl be seen as Asian or slightly so? Check. Does this character of long black hair? Check. This character really good at some sport and possibly had a falling out of some kind with the leader in the past? Check. Molly was one of my more favorite characters of the group just because she had some personality. Also, for whatever reason, she had the ability to open portals and banish the monsters which is normally an ability given to the leader, so that was something. Bonus: Aries’s ruling planet is Mars. I think the one character that broke most of the troupes of the magical girl genre was Kim. She’s a punk-rock kind of chick that just wants to get the team back together and to keep her friends safe. Her relationship with her boyfriend is subtle at first and really adorable. She’s depicted as a butch woman but acts like a sweet dork. Kim is my favorite character because she was unique and straight forward. Some of the other troupes include a group of clickish bullies who happen to be the villains in the end. Another was a magical girl gone rogue, trying to kill all other magical girls. A magical being is the one to give them their powers for no particular reason other than there are monsters about and an evil opposing force. Said magical being doesn’t really help them when needed and doesn’t play any real role in the story. Also magical girls are in high school, and started their careers at the beginning of high school. Zodiac Starforce has a lot of troupes that aren’t used in a satirical or comedic way, which made the story seem unoriginal to me. For people who don’t read a lot of magical girl stories or only watched Sailor Moon as a kid would probably really enjoy seeing all these things and reading the story. Honestly, I think the story would have been better if it had started from the beginning and showed the building of their friendship and then the battle that put them into retirement. I spent so much time wanting to know what happened to Emma to make her feel so broken up about being a Magical Girl. You find out that she lost her mother, but how did she lose her mother? And why did the group break apart and not talk to each other until Emma was in trouble? There were so many questions that were left unanswered and the characters made so many references to things that I had no knowledge of. There was clearly a history between all the characters but it was never shown or talked about, which just weakened the overall story. The artwork was okay. The character designs were pretty cool, especially Kim’s, but I wasn’t too impressed with their magical girl uniforms. I also wasn’t real impressed with the monster designs because they reminded me of the monsters in Steven Universe, they even had the gems that were related to corruption. The background wasn’t as developed and detailed as the main characters, even a lot of the unnamed or background characters were very nondescript and forgettable. Also there were details in the uniforms that didn’t stay consistent from panel to panel. The colors for this novel were various shades of pastel and red. Everything was either pastels or reds, which really overpowered some of the other colors. For instance, it took me a while to realize that Emma’s hair is blonde when she’s not transformed, but it was hard for me to tell because everything was so red or pink around her. Anyways, this wasn’t my favorite color scheme. The story left something to be desired. First chapter you’re thrown right in two years after the girls gained their powers and saved the world. All you know is that they disbanded, people died, and they banished an evil goddess (Also where were the minions of that goddess then, hm???). Emma is very reluctant to get the team back together, possibly showing signs of PTSD, but not much is explained and you’re left wondering what exactly happened. You also start with some drama between some of the girls, but that is suddenly dropped and never touched upon again in chapter two. A lot of the story relied on coincidence to move the plot forward, which lead to unexplained entrances, characters, and events. The dialogue at times came off as too immature or Hollywood high school, so it didn’t sound natural coming from a group of girls that risked their lives to save the world and fought monsters on the daily. Most of the characters were extremely underdeveloped. The story was weak and was nothing to write home about. If you’re into Magical Girls and comics this might be a good read for you. It has strong leading women of color, an interracial gay couple, and a diverse line-up of characters. I’d be interested in reading the next volume, but I won’t go out of my way to buy it. I’ll read it if I happen to find it in a local comic book store. Once upon a time, a greedy dragon kidnapped a beloved princess . . . But if you think she just waited around for some charming prince to rescue her, then you’re in for a surprise! Princess Mabelrose has enough brains and bravery to fend for herself! From a mighty dragon with an army of troll to a tyrant tiger king, Mabelrose meets each challenge with pluck and intelligence, winning the help and friendship of the many kindred spirits she encounters in her quest to find her wat home. So I found this book while I was at the beach over Christmas and I’ve been meaning to read it for a while. After finals and packing up my dorm room, I really wasn’t in the mood for a book so I decided to go with a graphic novel! Out of my huge stack this one jumped out at me first. This is by far the cutest story that I have read in a long time! For a children’s book, this story really took me by surprise and held my interest until the very end. There were some parts of the story that seemed to be a bit rushed or sudden, like there could have been more development. However, since this is a children’s story, I understand that a child wouldn’t necessarily notice or care for more development, they would want to jump straight into the action. With that in mind, Espinosa does a wonderful job setting up his world and characters enough without boring the reader. He also does an excellent job pacing his story as well, making it the action fast enough to keep up with a child’s attention span, but dragging it out enough to fit older readers as well. Anyways, I absolutely loved the characters! Mabelrose and her parents stole my heart in the first few pages of the story. Their relationship was so loving and adorable that sometimes I couldn’t help my slight happy squealing! Princess Mabelrose really surprised me, and I guess it’s because she isn’t your typical princess. She’s a bit of an outcast when it comes to royalty, not super proper or wearing the latest up to date fashion, but her interests and curiosity were quite genuine and so were her attempts at making friends. Still, I was surprised by how much courage she had in the beginning of her ordeal, I surely thought that it would take a rather defining moment for her to develop the courage she had. Instead, she relied heavily on her faith (something else I haven’t seen in a while) and took matters into her own hands. It was her stubbornness and independence that really won me over, making me wish that I had her along with Princess Leia when I was growing up! I also enjoyed some of the themes that I found in the graphic novel. There was bravery in the face of danger, but also other lessons buried in this Coming of Age story. One lesson that really surprised me was keeping faith in your darkest hour. It’s been a while since I’ve seen something like that in a story, especially nowadays. I found it charming though, because a specific faith was never mentioned and it was clear that there was more than one that the characters, and supporting characters, believed in. It was a nice change to read a story that used faith to help their characters, and not see conflict between the various faiths. It was wonderful to actually read true coexistence amongst faiths. I recommend this graphic novel to any parent looking for something to read to their younger children, or for children that want to get into comics. Sure, there’re no super heroes and it’s set in a fairytale world, but Mabelrose is a wonderful role model for young girls and boys. 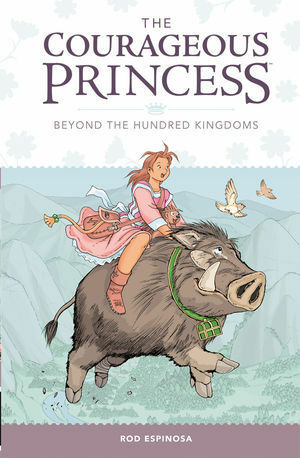 The princess is the embodiment of courage and faith, showing that even in the toughest times you can do something great if you’re brave enough to try. 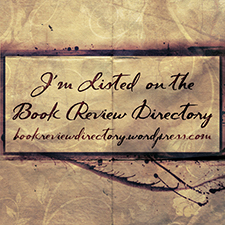 I also recommend it to anyone who loves fairytales and wants a light graphic novel read! Not every reader has to be a child. I do have to say that if reading about a story that focuses heavily on faith makes you uncomfortable, then this might not be for you. While no specific faith is named, there are at least a few different ones running around and the main characters do pray a lot throughout the story. It’s something that you can’t really skip either, because it’s one of the larger themes of the story. For a book targeted for children the story is pretty solid. There were some parts that seemed a little rushed that could’ve used some extension, but children wouldn’t really notice that anyways. The characters each had their little quirks that really made them lovable and enjoyable to read, even the minor characters really stuck out to me. I’ve seen some complaints about the amount of praying in the story. Honestly, for me, I actually enjoyed how much the main character prayed and relied on her faith to help her find strength. It was also nice to see more than one religion in the story and not one bashing the other, just a subtle example of coexistence. I really enjoyed the art; it brought me back to my childhood when I would read illustrated children’s stories with similar art. I loved how simple the style was. Everything was simplistic, and the artist used color to really make the characters stand out. I also loved how the story used colors and shades to set the mood as well, something that can be hard to do sometimes with a simplistic art style. All in all, this will definitely be one of the stories that I’ll read to my kids one day!